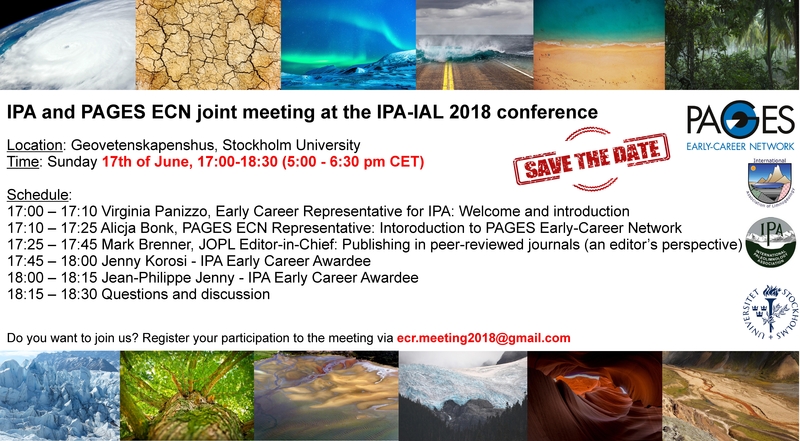 The IPA-IAL 2018 Joint Meeting: Unravelling the Past and Future of Lakes will be held in Stockholm, Sweden, from 18-21 June 2018. The conference will be held at Stockholm University at the Frescati campus. Plenary sessions will take place in Aula Magna. Parallel sessions will be held at both Aula Magna and the Geohus, which is located just across the lawn. Pre-conference courses and poster sessions will be held at the Geohus. The meeting will be held over four days with a half-day field trip during the week. A number of parallel sessions will run during the day and poster sessions are saved for the afternoons. The abstract submission deadline is 16 March. Decisions on abstracts will be made in April. Early bird registration will close 30 April, after which full registration fees will apply. Annually laminated (i.e. varved) sediments are known at multitudinous locations in diverse lacustrine and marine settings. Varves provide high-resolution sedimentary records with precise incremental time control, which can yield detailed time-series of biological, stable and radiogenic isotopic, geochemical and sedimentological parameters. Varve analysis can (i) yield climate reconstructions linked to topics such as hydroclimatic conditions, precipitation, and temperature, (ii) provide information on events like volcanic eruptions, earthquakes and flooding, and (iii) increase our understanding of anthropogenic impacts, such as soil erosion, pollution, and eutrophication on aquatic environments. Varves can document frequency and rates of change for environmentally relevant processes and enhance our understanding of sedimentary processes when applied together with sediment trapping and instrumental monitoring. This session appeals to a multidisciplinary audience of sedimentologists, paleolimnologists, and limnogeologists studying varves with high-temporal resolution at all timescales and from different environments. We welcome contributions related to climate, anthropogenic impacts on aquatic environments, and environmental monitoring. Moreover, we invite reports about developments in the interpretation of varves and improvements of geochronology, as well as new analytical techniques. This session is organized by the PAGES-endorsed Varves Working Group.